Performance meets parquet. Elite design, classic look. Introducing the newest Orlando Magic jerseys by Nike. Orlando has always been a city for dreamers. It’s where imagination becomes reality, and it’s where fans believe in Magic. 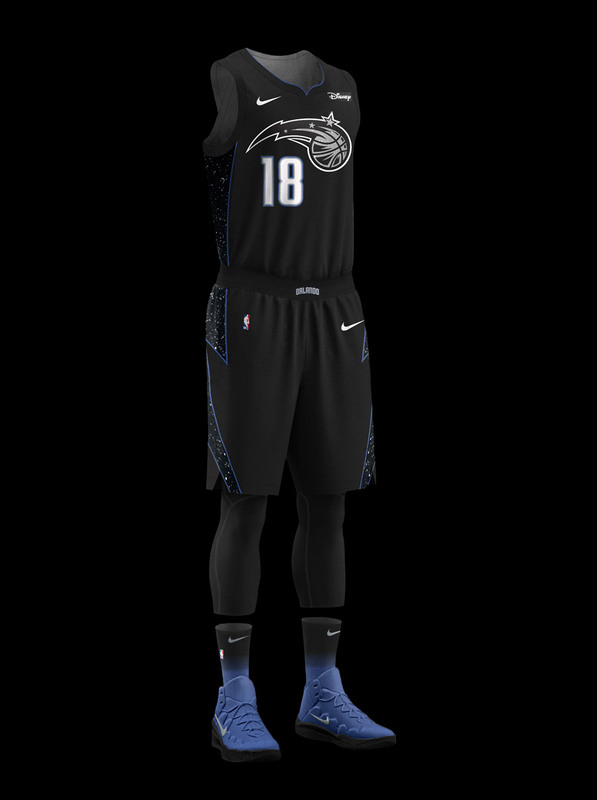 The Orlando Magic City Edition uniform represents the dreamer in each of us. It invites us to dream beyond limits and reach for the stars. The original Magic home uniforms featured black pinstripes, silver stars as a replacement for the “a” and the superscript dot in “i” in “Magic” and a pair of stars on each side of the shorts. The player’s jersey number was colored in black with a blue border. The player’s name was printed in blue with no border. Some of the more memorable moments when the Magic wore this uniform include Nick Anderson’s steal on Michael Jordan, Orlando’s Game 7 win over Indiana in the 1995 conference finals and Penny Hardaway’s back-to-back 40-plus scoring performances in Games 3 and 4 of the Magic’s playoff series against the Heat in 1997. The original Magic road uniforms were black with white pinstripes. A silver star with a blue border replaced the “a” in “Orlando” and, like the home uniform during this era, featured iconic stars on each side of the shorts. The player’s jersey number was colored in blue with a white border. The player’s name was printed in white. 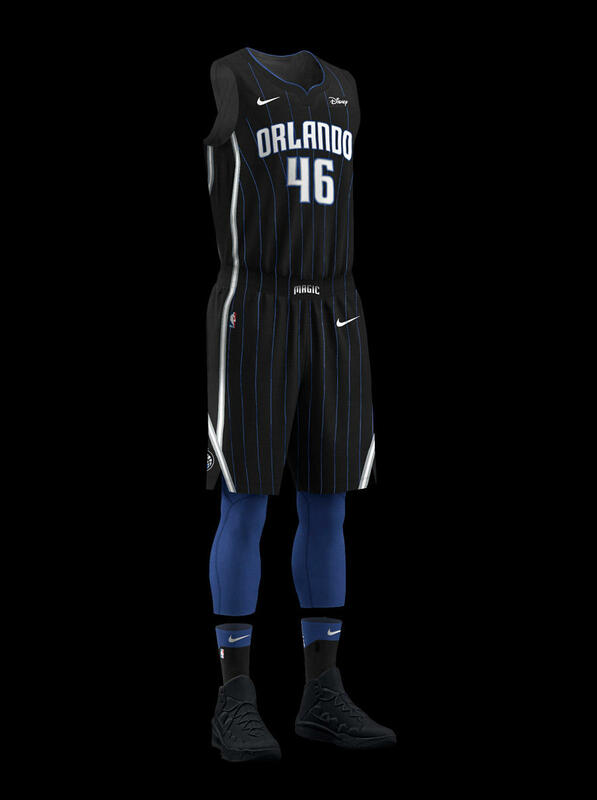 The Magic wore this uniform as a throwback and alternate for select games in more recent years. Nick Anderson’s 50-point performance, which was on the same night Shaquille O’Neal broke down the basket, in New Jersey in 1993 and three Christmas Day games (including the Tracy McGrady vs. LeBron James duel in 2003) occurred while Orlando wore this uniform. The second Magic road uniforms were blue with white pinstripes. Like the previous black road threads, a silver star replaced the “a” in “Orlando.” However, on this style the border on that star was black instead of blue (same for the stars on each side of the shorts). The player’s jersey number was white with a black border and the player’s name was printed in white with no border. The Magic closed down the Boston Garden in this uniform (Game 4 win in 1995 playoffs over Celtics). These jerseys were also worn during Game 6 of the 1995 conference semifinals when Orlando became the only team from 1991-1998 to eliminate Michael Jordan from the playoffs. 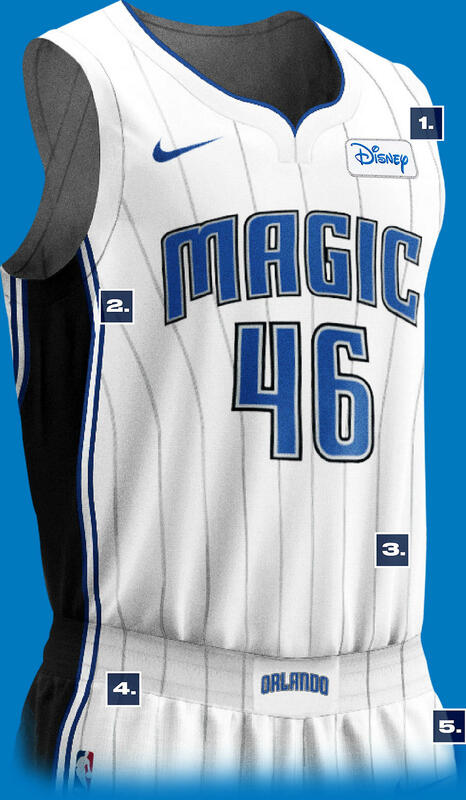 The pinstripes were removed for the second Magic home uniforms and the font of “Magic” across the chest was altered. The silver stars still replaced the “a” and the superscript dot in “i” but on this jersey they were a tad larger and smeared over to the neighboring letters. Negligible white stars were spread across the uniform and the sides of both the jersey top and shorts had three lines (two were blue and one was black). The player’s name and number were both blue with a black border. The ball swoosh was stamped on the front of the shorts near the waistline. Darrell Armstrong’s famous steal and game-winning layup against the Sixers in 1999 and Bo Outlaw’s triple-double in 2000 vs. the Celtics happened while the Magic wore these threads. The pinstripes were removed for the third Magic road uniforms and replaced with stars (sprinkled all over the jersey and shorts). Also different from the previous road jerseys, “Magic” was inscribed across the chest rather than “Orlando.” Like the home version during this era, silver stars substituted the “a” and superscript “i” in “Magic.” The player’s name and number were both white with a black border. The Magic’s alternate logo was engraved on the front of the shorts near the waistline. The Magic won an overtime thriller against the Hawks at the Alexander Memorial Coliseum at McDonald’s Center in Atlanta in 1999 while sporting this uniform. This was one of few times the Magic played a regular season game at a non-NBA venue. The look was virtually the same as the prior home uniforms (1998-2000) except there were updated logos on the shorts and they were put in different spots. A portion of the team’s new primary logo was placed on the back of the shorts near the waistline and the alternate emblem was positioned on the front near the bottom. Several of Tracy McGrady’s spectacular performances transpired while he wore this uniform, including two of his 50-plus scoring eruptions (vs. Wizards and Bulls). The look was nearly the same as the prior road uniforms (1998-2000) except, like the home threads during this era, the logos were different and in different spots. A portion of the team’s new primary logo was placed on the back of the shorts near the waistline and the alternate emblem was positioned on the front near the bottom. 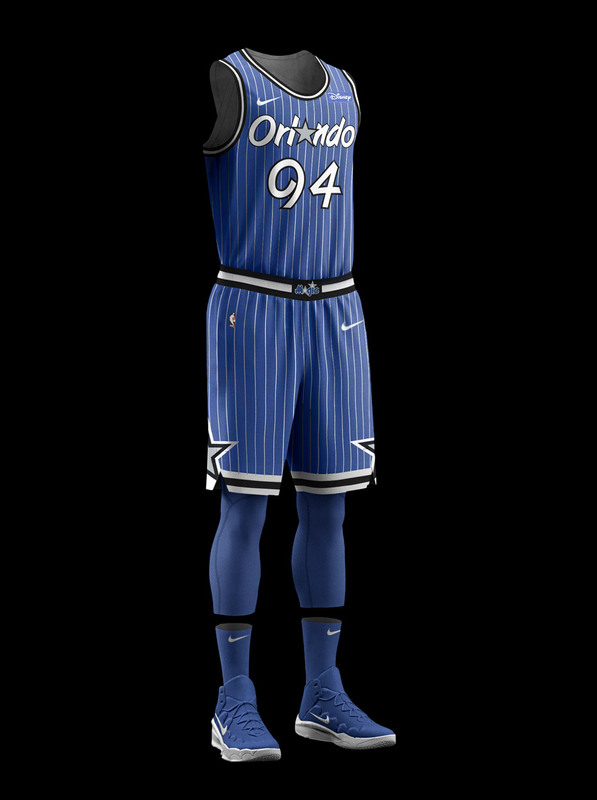 Orlando had these uniforms on when Tracy McGrady delivered back-to-back 40-plus scoring performances against the Pistons in Games 1 and 2 of the First Round of the 2003 playoffs. He scored 43 points in Game 1 and 46 in Game 2. The print on these uniforms featured a lighter shade of blue and the lettering across the chest was all upper case with a block-style font (silver stars removed). A silver star, however, was carved in at the low neckline and two alternate logos wrapped around each side of the shorts. There was also a pair of blue lines that ran up and down the entire uniform on each side. Tracy McGrady recorded a franchise-best 62 points against the Wizards in 2004. Steve Francis hit a game-winning shot against the Bucks in his first regular season game with the Magic in 2005. Dwight Howard posted three 20-20 performances in the same playoff series vs. the Raptors in 2008. Those were just three of the most memorable moments that occurred when Orlando wore this uniform. 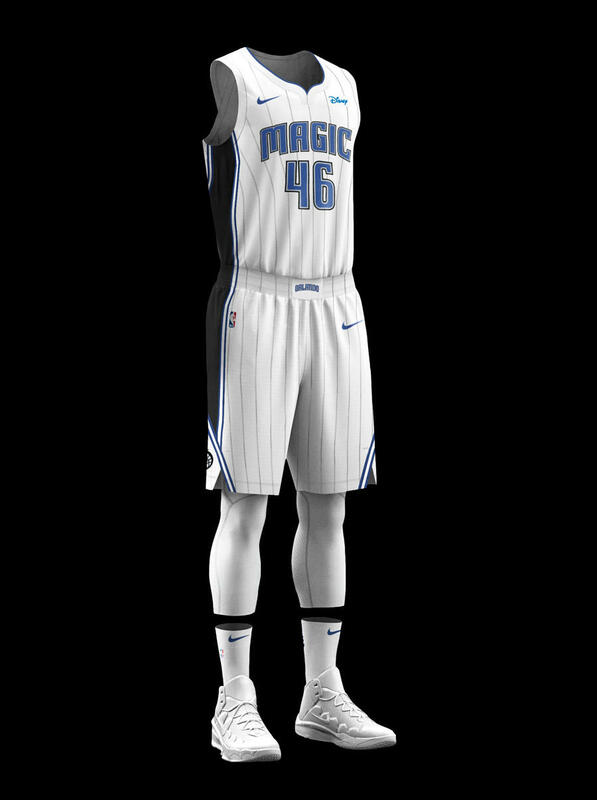 “ORLANDO” replaced “MAGIC” on the chest for this edition of blue Magic road jerseys. Like the home uniforms during this period, the lettering was all upper case with a block-style font and an iconic silver star appeared at the low neckline. The logos on the shorts appeared the same as the home version as well. Dwight Howard delivered a remarkable 30-point, 25-rebound effort against the Warriors in 2007 and Orlando came up with a huge win in Toronto in Game 4 of their playoff series in 2008 while wearing these uniforms. Pinstripes were added back in for these Magic home uniforms. For the first time in team history, no silver stars lived on the uniform. There was also a slight adjustment to the font of the lettering on the front of the jersey. A strand of black ran down the sides of the uniform. The Magic’s alternate logo was placed above the player’s name and “Orlando” was sewed in on the back of the shorts near the waistline. There were so many remarkable moments that took place while the Magic donned this look, including the Magic thrashing the Cavs in Game 6 of the 2009 conference finals and Jameer Nelson (vs. Nuggets) and Nikola Vucevic (vs. Lakers) each buried game-winning buzzer-beaters. The road uniforms of this era were similar to the home threads except “ORLANDO” replaced “MAGIC” on the chest and “Magic” (not Orlando) was sewed in on the back of the shorts. These blue away uniforms, like the home version, featured silver pinstripes. Associated with this uniform is Hedo Turkoglu’s game-winning 3-pointer in Philadelphia during the 2009 playoffs and Aaron Gordon’s dazzling dunk contest display in 2016. These alternates were similar to the blue look during this time except the emblem was removed from the back of the shorts. Jameer Nelson became the Magic’s all-time assists leader while wearing this uniform during a game in Portland in 2013. The pride jerseys were sleeved and silver to represent “steel,” a rigid, unbending and relentless symbol of unity created to invoke a sense of “pride” and an unyielding commitment to competing at the highest level. These uniforms also paid homage to the Magic’s iconic silver stars that have been part of the team’s logo lineage. Tobias Harris buried a game-winning shot against the Hawks in 2014 and Victor Oladipo erupted for 45 points vs. the Cavs while the Magic donned this look. The carbon-colored Stars jersey was designed with lightweight, sweat-wicking technology. The star of the jersey was the ball swoosh, the team’s alternate logo. The iconic silver star also returned and was placed at the hem of the shorts. This uniform represented teamwork, tradition and toughness – the pillars of the past and the fight of the future. The Nike “Association” edition represents an achievement that most athletes have worked their entire lives to reach. Keeping the team’s iconic pinstripes, this look has a more classic look. This modernized, sweat-wicking, sustainable design has a vastly improved fit with altered construction and hemlines on the shoulder. The Nike “Icon” edition represents the heritage and iconic identity of each NBA franchise. This look focuses on the legendary pinstripes in the blue Magic uniforms. Like the “Association” jersey, this modernized, sweat-wicking, sustainable design has a vastly improved fit with altered construction and hemlines on the shoulder. 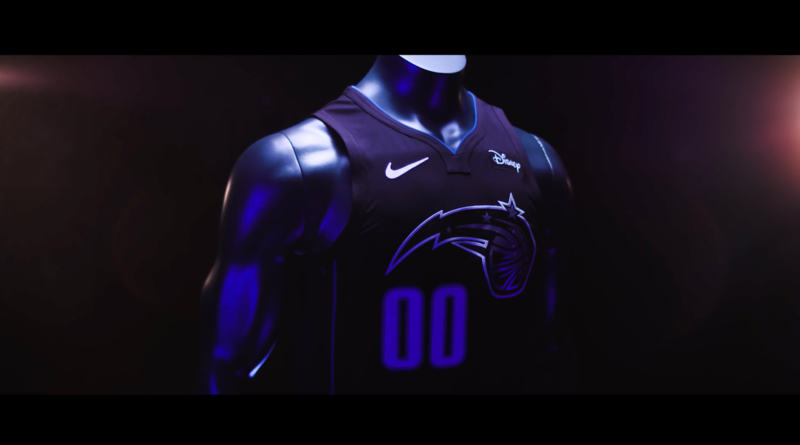 The Nike “Statement” edition followed the unveiling of the ‘Association’ and ‘Icon’ threads and is black with blue pinstripes, representing strength, power, and confidence. They set the tone for big games or rivalries and is inspired by the Magic's desire to make a bold statement every time they step on the court. All Jerseys Now On Sale! Visit the Orlando Magic Team Shop at Amway Center.